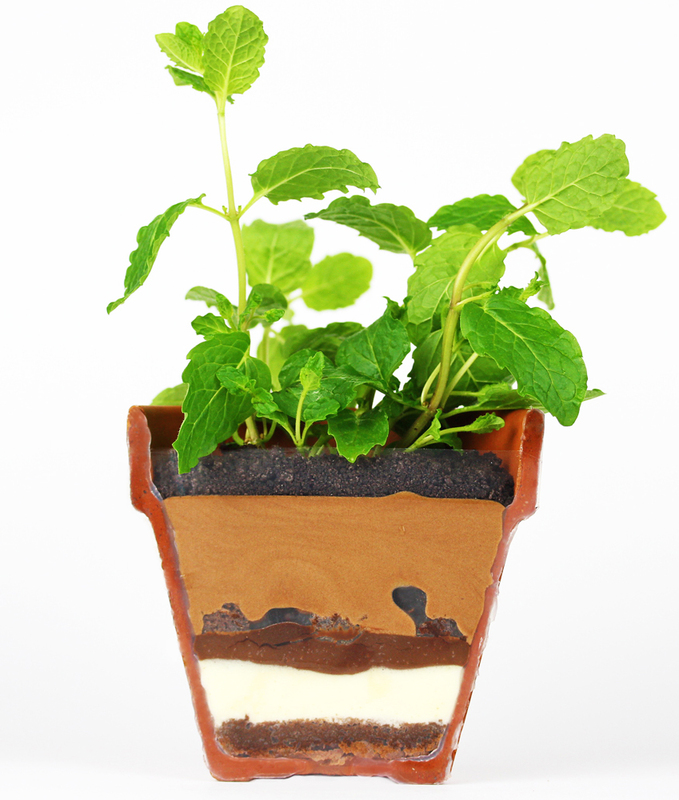 A Pudding in a Plantpot …. Blooming crazy. 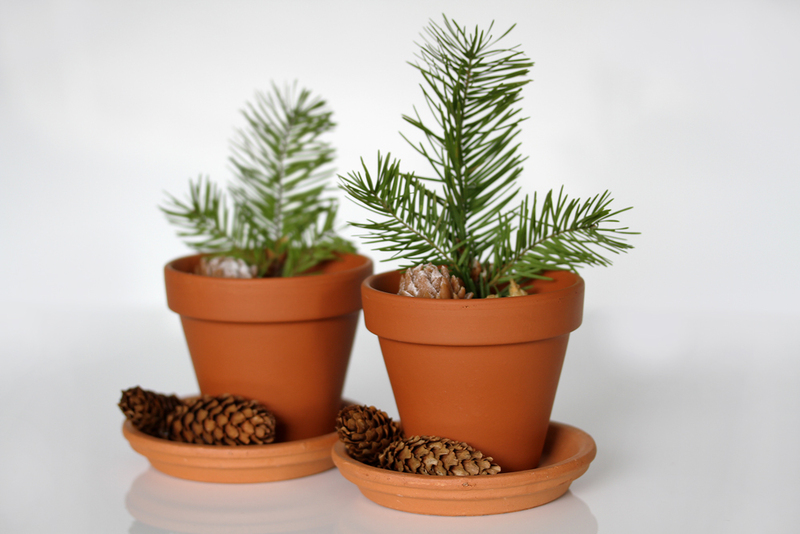 They turned out a great success in the office at work and even even managed to make the local papers….well you have to admit , they look pretty realistic below and a perfect “plant” ( if you`ll pardon the pun ) to wind the children and family up. One of the office guys took a couple home to share with the family. It was a bit of a “look kids, daddy`s gone mad , he`s eating soil ” kind of thing. His birthday came the following weekend and he`d gone on about it so much that his good lady wife decided to surprise him with a special dessert for the party.” Can you make something really poncey ” ? ….that was to be my guidline for the 20 or so guests. She actually asked me to do the plantpots again but `not a chance` i told her, `they take days to complete`…. “Tell you what Elizabeth – i`ll do them but with only two or three layers , something really simple”…..The deal was done. So basically, me being me , a total “soft touch” , pushover and a glutton for punishment i had the simple task of a quick and easy double layered pud served up in a plantpot instead of a dessert glass…..and would i complicate that ?……. Nah….not me. 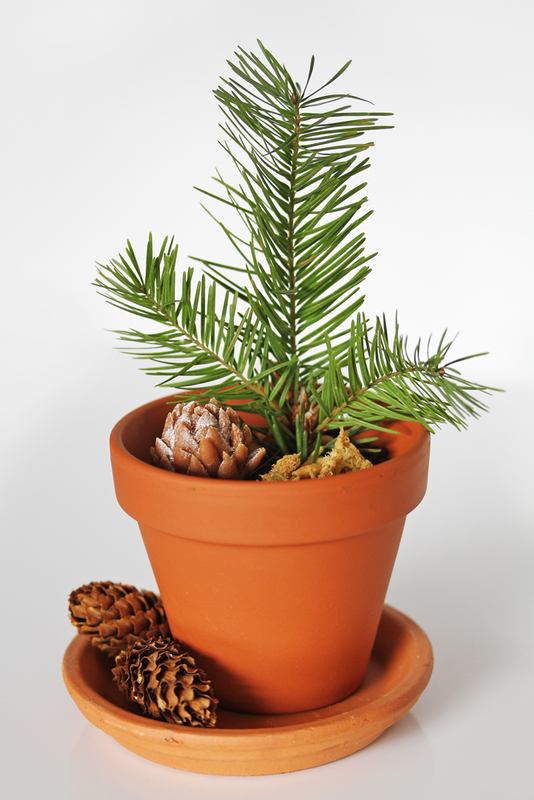 Right then – So here`s how to make my ” 8 ” layer, Douglas fir pine tree , Mango, coconut and `Honey cube` with edible forest floor textured dessert… in a plantpot ……. The boy`s a fool. 1st layer – A Biscuit base (basic Cheesecake mix ) . The plantpot hole was covered with a large sized Milk chocolate button before adding the layer of Butter and Oatmeal biscuits. 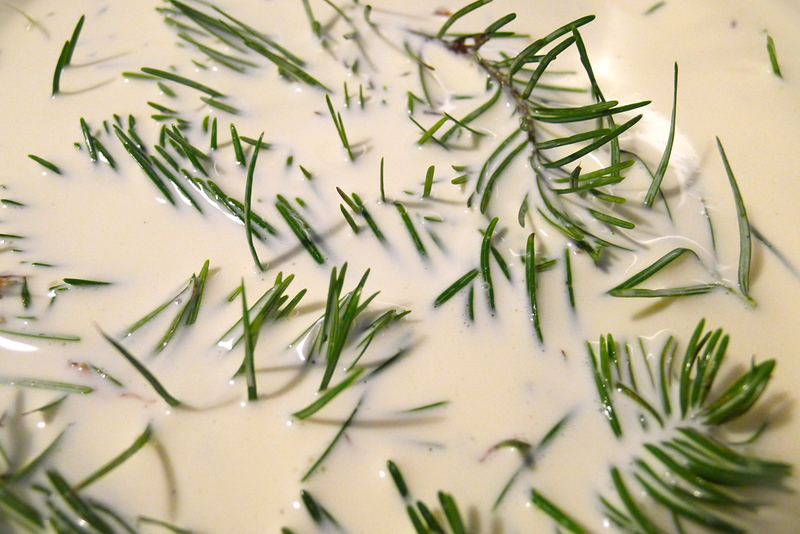 2nd layer – A rich Pannacotta cream mix infused with freshly picked Douglas fir ( pine tree ) shoots. 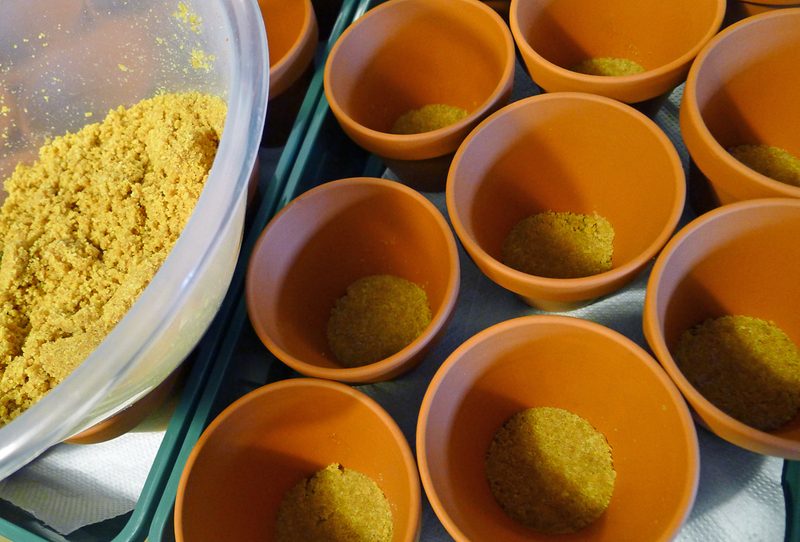 3rd layer – Home made Mango and Lime zest curd. 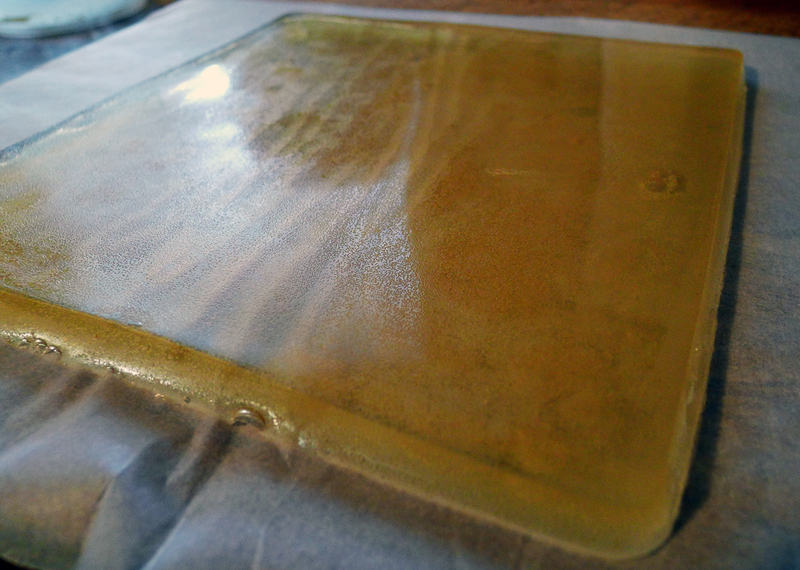 4th layer – Vanilla sponge. 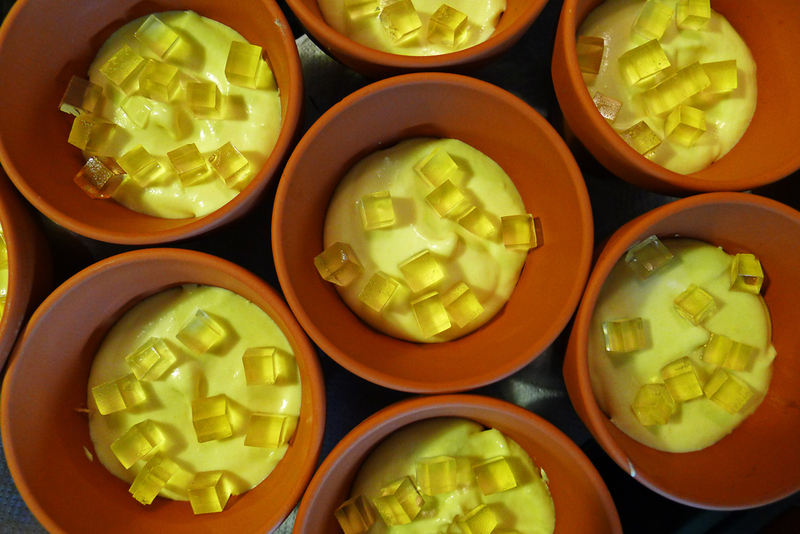 7th layer – Mango and Lime jelly with fresh Mango pieces. 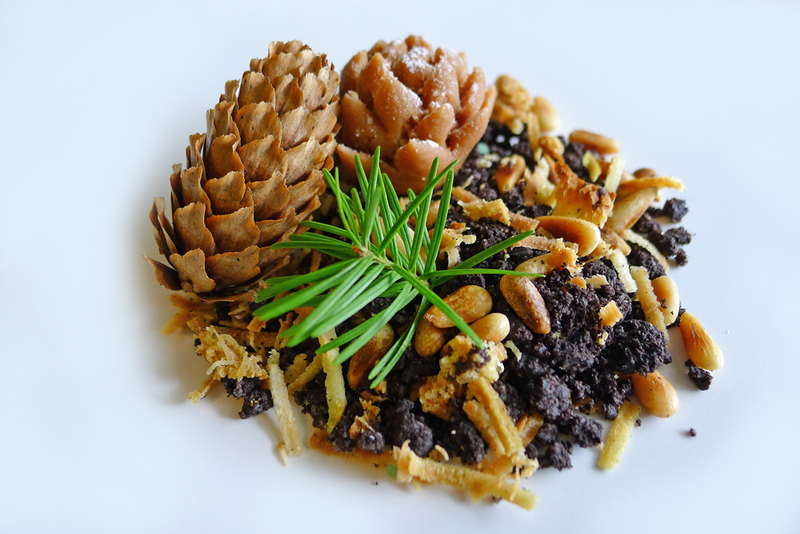 8th layer – The forest floor – Edible soil , Coconut moss , pine needles , pine nuts , edible acorns ,and a little surprise to get people laughing….. green popping candy hidden away in the undergrowth. 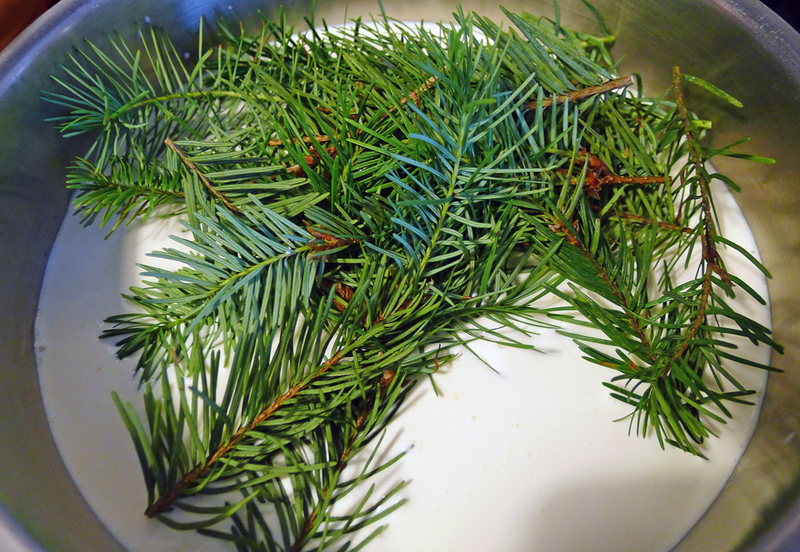 To top it all off – Freshly picked Douglas fir shoots….. The only non edible part. Here`s the recipe for the dessert , its all the layers but the simple way to try it at home without all the heartache would be to just go for 3 layers. 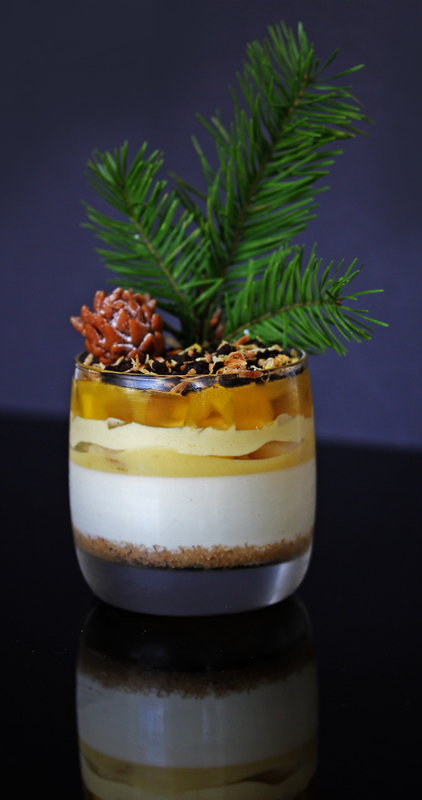 The biscuit base topped with the pannacotta ( you dont have to use pine ) .Let the layer set then add the Mango bavarois , let that set then top with the soil….Simple.Add more layers if you want the challenge. 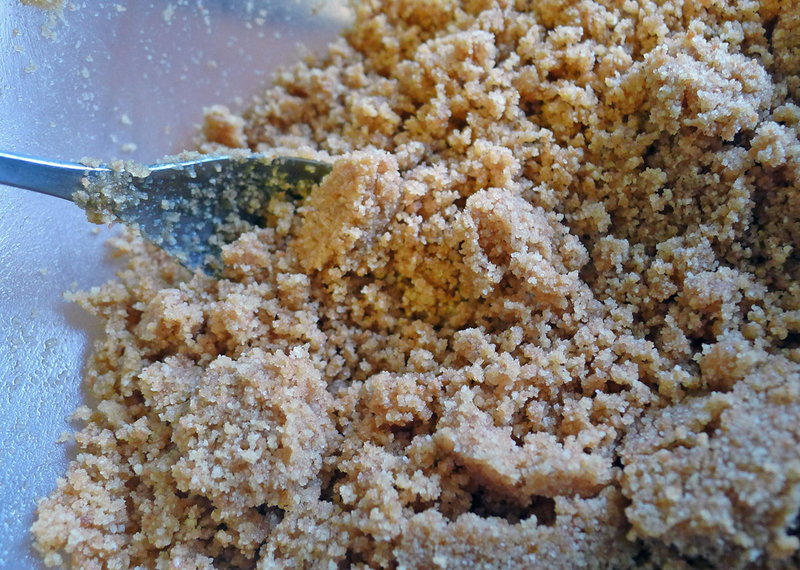 BISCUIT BASE – A basic mixture of 250g crushed Oatmeal ( digestives ) biscuits mixed with 100g of melted Unsalted butter then pressed into the base of the mould. 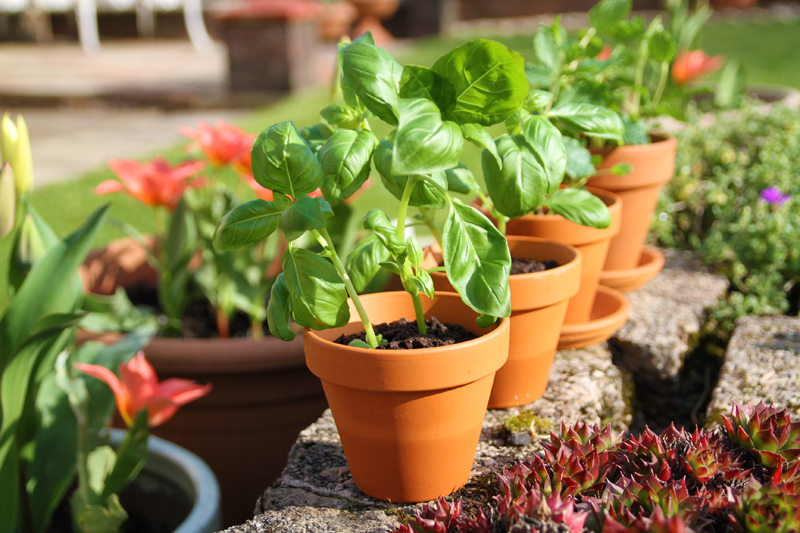 Use a white chocolate button in the bottom of the plantpot to stop the mix falling through. 1, Vanilla pod , split and seeds taken out. 3, 300 ml of full cream milk. 4, 6 tbsp Caster sugar. A nice handful and a bit more of Douglas fir shoots. 2 1/2 teaspoons of powdered gelatine. 1, Place the vanilla seeds into a saucepan along with the cream , milk , sugar and douglas fir shoots , put over a slow heat and gently bring up to boiling point. 2, Turn down the heat to a gentle simmer for approximately 10 minutes then remove from the heat. 3, Add the gelatine powder to 2 tablespoons of cold water and allow to soak for 5 minutes.Heat gently to melt the mixture in the microwave but DO NOT boil. 4, Add the gelatine to the hot cream mixture then mix together well.Pass the mixture through a fine sieve then allow to cool completely. 5, Once cooled , pour the mixture over the biscuit base and carefully transfer into the fridge to set the layer. The flesh from 2 Mangoes (to make 315ml puree). 1. Puree the Mango flesh then strain through a sieve to remove any fibre. 2, Measure out 315 ml of the Mango puree. 3 Melt the butter in a saucepan then whisk in the remaining ingredients including the puree. 5, Pass through a sieve and store in sterilized jars ( in the fridge ) Shelf life approximately 4 weeks. 6 tablespoons of caster sugar. 3 tablespoons of Plain flour. 2, line a baking sheet with baking parchement or greaseproof paper. 4, sift the flours together then sift again into the egg mixture , gently fold the two together until fully mixed. 6, Allow the sponge to cool then peel off the paper and cut into disks with a sharp round cutter. 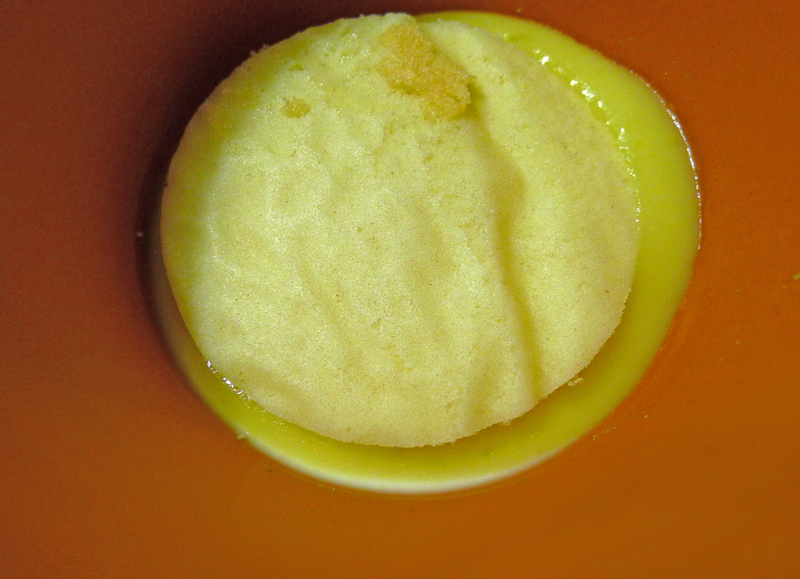 The sponge disk sits on top of the Mango curd. 120 g of Whipping cream. 1 , Place 30g of the Mango puree into a saucepan and heat gently with the sugar until it dissolves. 2, Remove the pan from the heat and add the Gelatine ( pre soak in cold water for 5 minutes ) 3, Add the rest of the Mango puree and mix together well. 4, Whip the cream to soft peaks and fold into the puree until it is all combined well. 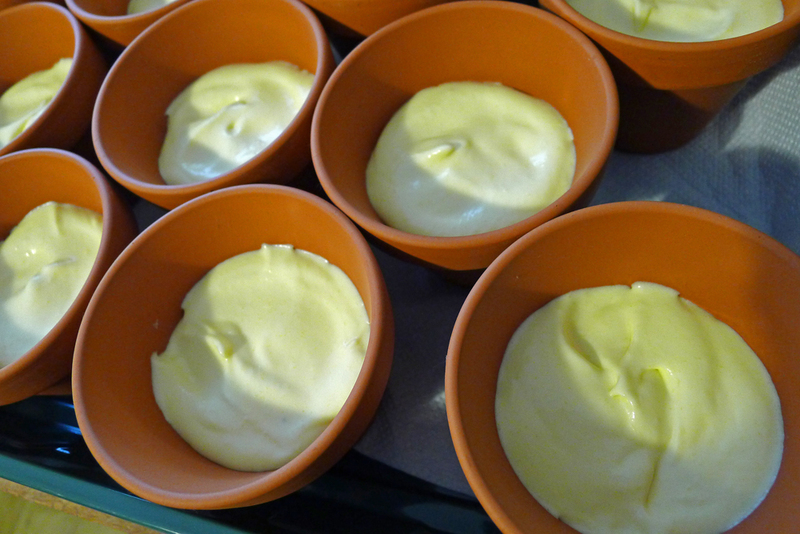 The Mango mousse is then portioned over the sponge layer and allowed to set. 1, Pour the honey , water and Marsala into a saucepan. Add the Gellan gum and mix in throughly using a blender. 2, Bring up to the boil slowly and then simmer for 3 minutes. 3, Pour the mixture into a silicone cake mould and allow to cool and set. 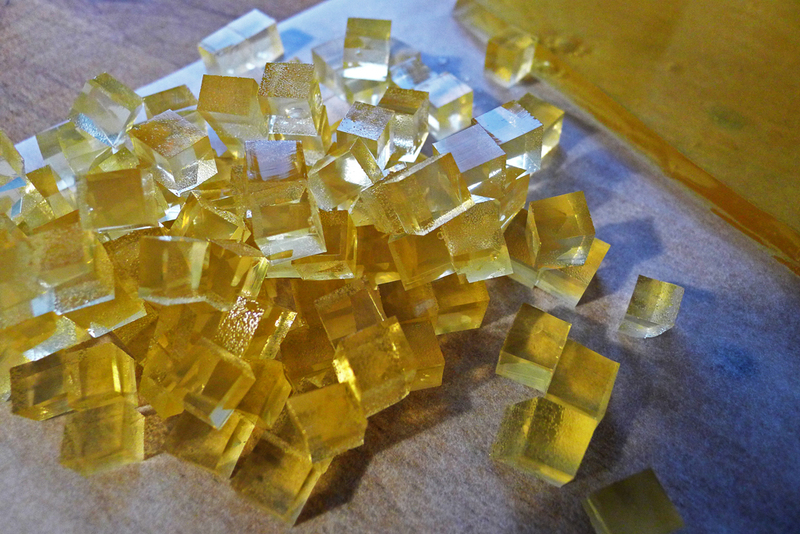 4, Using a sharp knife accurately cut the set gel into slices and then cubes. Arrange a few Honey cubes on each layer of Mango Bavarois. 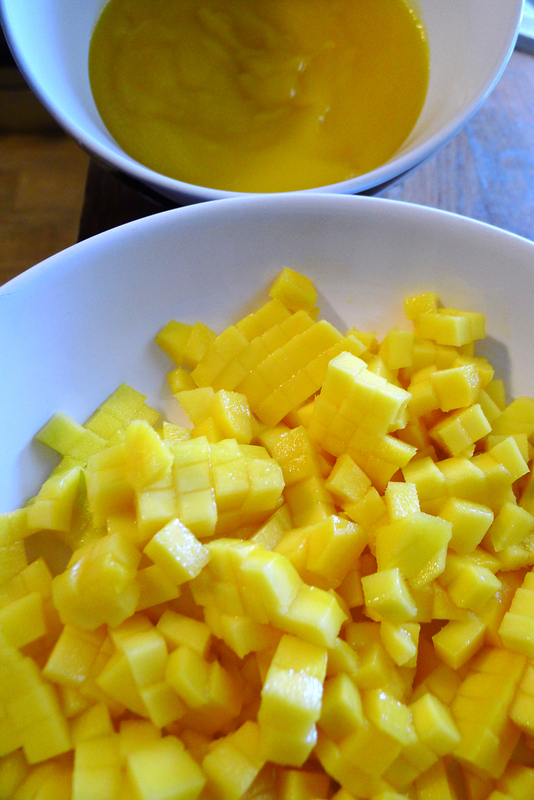 1 Mango – diced into small cubes. 1, Peel Mango , then cut the flesh into small cubes. 2, Add the puree to a small saucepan, add the sugar and heat gently until dissolved. 3, Add the softened gelatine to the hot Mango puree and stir until melted and blended into the mix. 4, Add the Mango cubes and dilute with Mango juice if the mixture is too thick. Compensate with more gelatine if required. 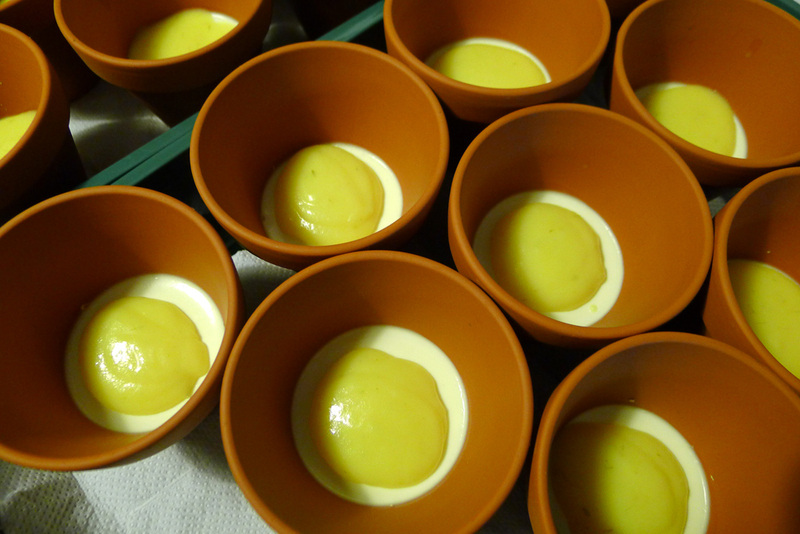 5, Add the Mango jelly to the top of each plantpot and allow time to set. The Acorns are a fairly simple affair. Just get some Marzipan and colour it brown with cocoa powder. 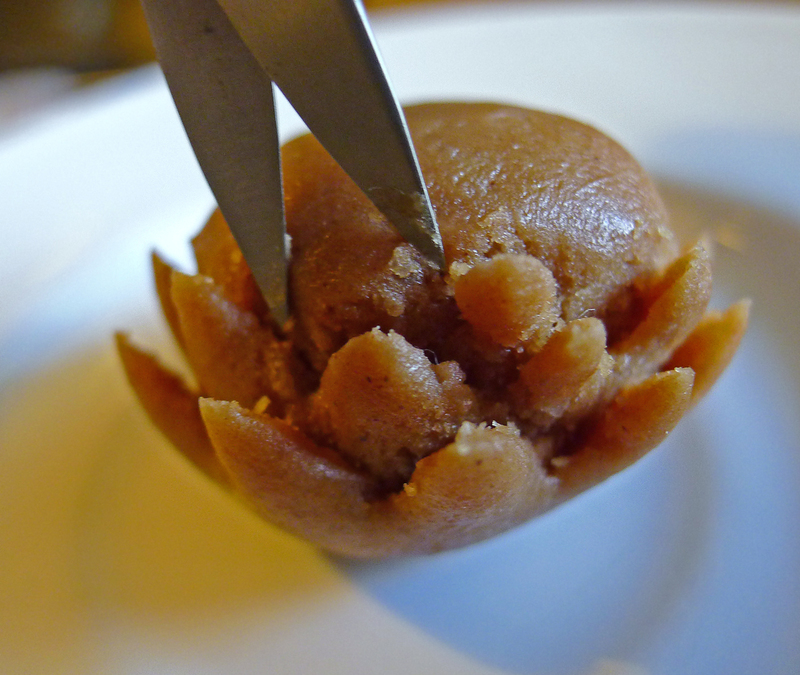 Roll into equal size balls , stick one to a saucer and then snip little pieces out as you turn the plate with one hand. 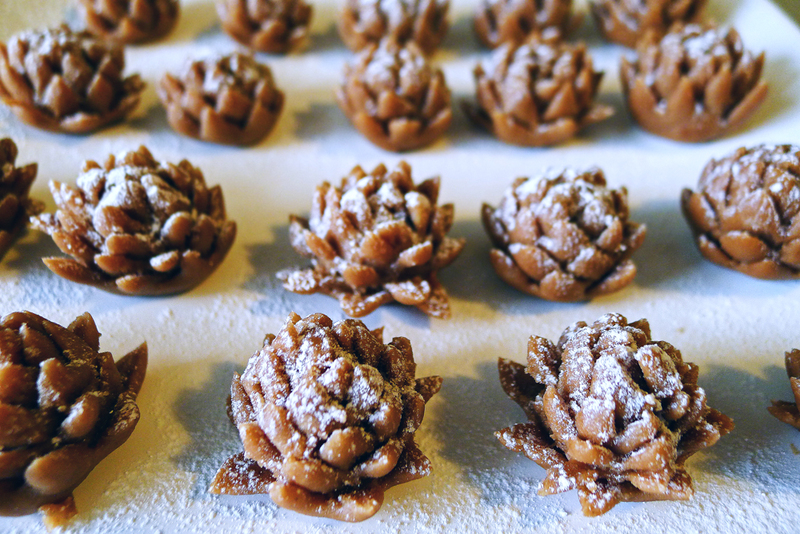 Here`s my little army of Marzipan Pine cones. 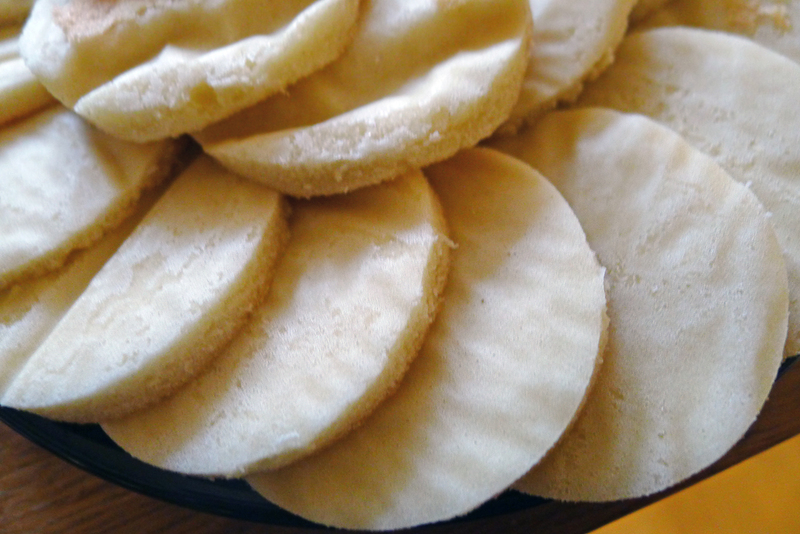 There`s lots of Cheffy Chefs secret recipes for edible soil but the best ones are always the simplest.Drop a packet of Oreos into a plastic bag , bash away wildly with a rolling pin. Mix everything up together and you have the most authentic compost you`ll ever find. 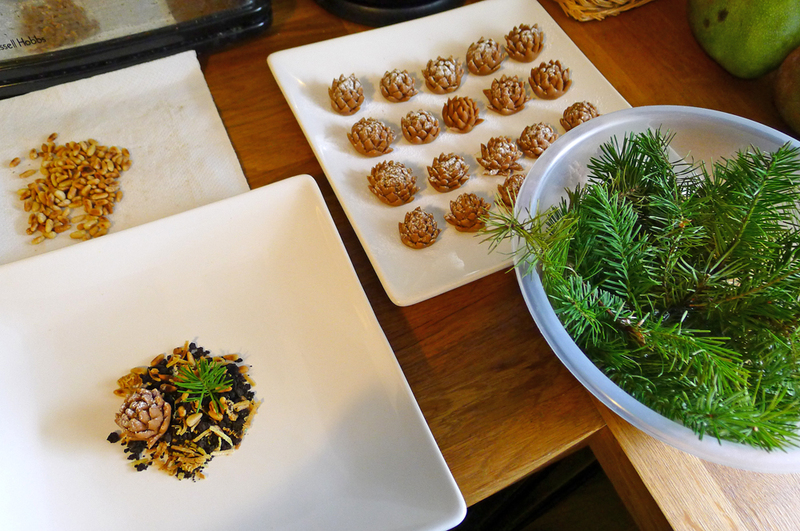 A little look at the prep for the topping , Pine nuts , Acorns , fresh sprigs of Douglas fir and a little layout of what it looks like all assembled. 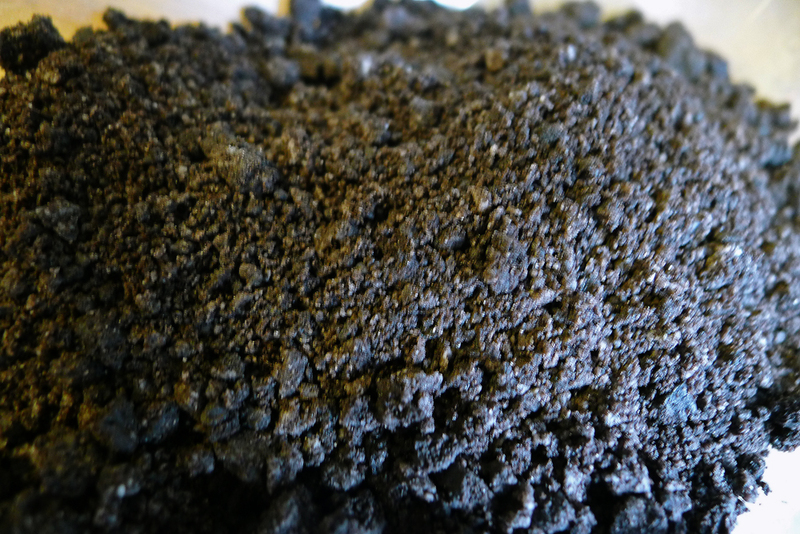 Chocolate soil – A packet of Oreos bashed up with a rolling pin. Marzipan Acorns – coloured brown with Chocolate powder. Toasted pine nuts – dry toasted in a saute pan. Finely shredded Coconut , a little green food colouring and then oven dried to replicate moss. Shredded Coconut shards , a little green food colouring then oven toasted to replicate pine needles. A little surprise – Hidden green popping candy to get everyone smiling. And finally….. The finished item , all scoffed in minutes. This was just made from leftovers , and basically a little glimpse of what lies inside the plantpot.The layers can all be adjusted to suit. Previous Post SoLITA – The place to be seen in Manchester. Next Post The Langdale hotel , Cumbria, another undiscovered secret hideaway. Outstanding! Thank you especially, for the cubes of jellied honey. I’ve been searching for exactly what you have shown. I’m going to attempt the honey cubes with powdered gelatin and an infusion of lavender – or fennel (haven’t yet decided) – as a garnish for pineapple. Sounds ok Heidi…and maybe include some lime to balance it all up nicely. Hi, first of all I would like to thank you for a great website. Its so inspirational for me. Lot of great ideas and great presentation of the food. I would like to ask you if you have any experience of layering gellan jellies. For example, two ingredients like orange and Campari. How do you stick them together? Sorry Vojta….that one`s got me. Maybe Hestons Fat duck cookbook might help you a little.